Folk who know me either through String or in person know that I’m generally not prone to enthusiastic gushing. Passionate ranting, perhaps, but prancing around in delight is not part of my idiom. 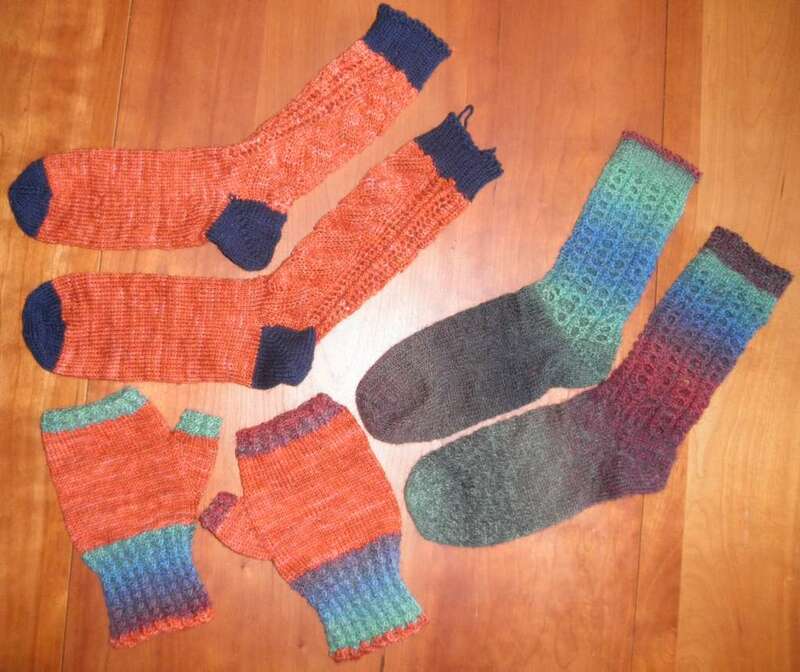 Two pairs of socks and a pair of Fingerless Whatevers. Socks are headed to Elder Daughter, whose pitiful pleas will now be gratified. I’ve wanted to get a new flat frame for quite a while. My old one having been bought in the early ’70s, using babysitting money when I was still in high school. Frame technology has advanced. I was very impressed by the review of the thing over at Needle ‘n Thread. Her pix are better than I could manage, and I agree with her observations wholeheartedly. The frame is well made, and works exactly as presented. 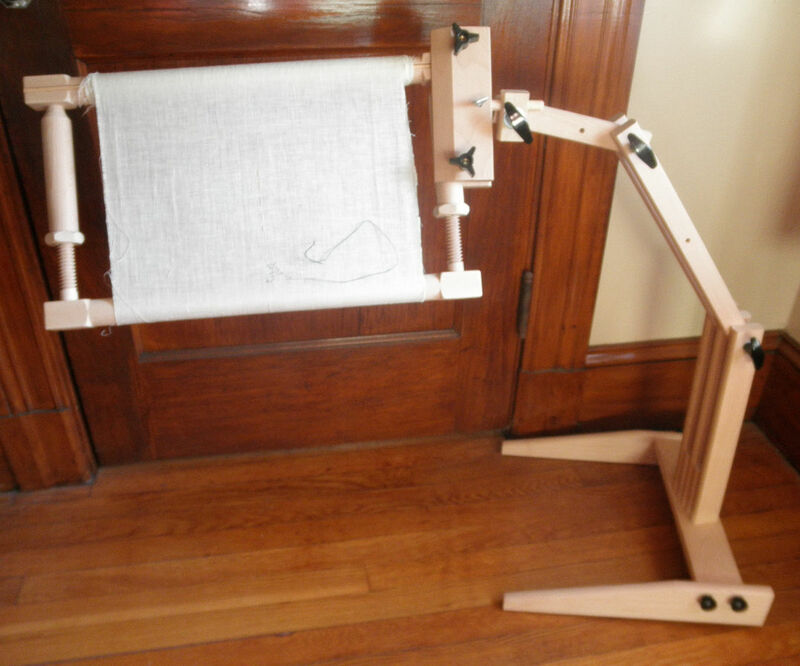 It’s easy to load with the work (minimal frame dressing), easy to adjust, and a delight to use. All in all a quantum leap over my old one. It holds my Millennium nicely in its omnivorous grasp. Just barely, though. I will take the three bolts that make up the fastening mechanism of the jaws to the hardware store this weekend, and look for some that are a bit longer. And if having this miracle of modern needlework support infrastructure wasn’t enough to hyperventilate about, I have more to celebrate! Stitch attributions range all over, in part because there are several ways that a mesh background can be achieved (withdrawn thread; withdrawn thread to make a grid, then darning; pulled thread, etc.) Some books specify that these patterns used Italian Two-Sided Cross Stitch, others say Four-Sided Stitch in addition (or instead) of using an Italian stitch/style name. At this point, I’ll agree with them all because all are feasible. But after long experimentation I’ve finally found a method that’s achievable. It’s the same pattern as the museum piece. I’m working the mesh in two passes. The first is an easy to count pass of double sided cross stitch, worked double and pulled very tightly. 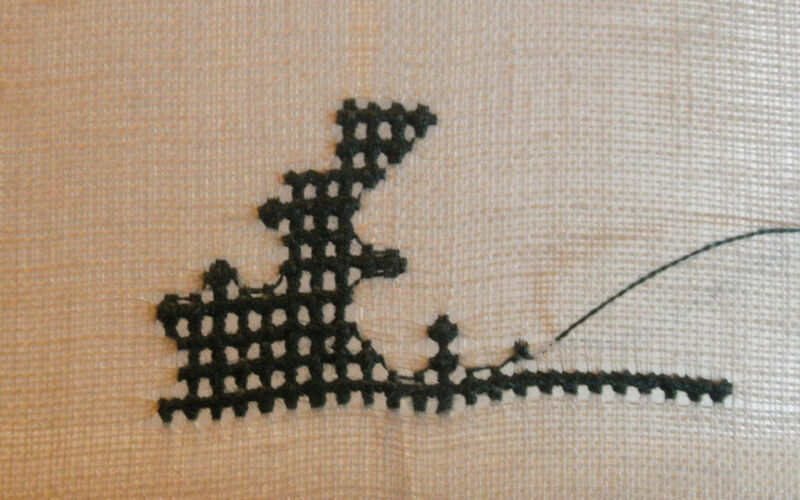 The second is a pass in which the bars formed between the cross stitch are whipped four times (two times on edges butting up on un-mesh areas). It’s totally two-sided, identical front and back. While not exactly speedy, using the initial pass to establish the counted pattern is easy, and the fill-in whipping to create the mesh is far less think-intensive than working the same pattern in hard-to-see-the-count long-armed cross stitch. Is this Punto di Milano or Tela Tirata? I am not sure. But it’s darn close! Flat frame on a stand. You need two hands to do this. Relatively loosely woven ground cloth. Most modern even weaves are too dense. This nice, airy piece of linen was provided by StitchPal Pam (Hi, Pam! ), who found it too gauzy for her needs. But it’s perfect for mine. High thread count ground. Although the weave density on this is good, it’s a bit coarse for this work. To achieve the compression that leaves nice big holes, stitches need to span 3-4 (or more) threads. I’m using 40 count here, stitching over 4 threads. 60 count would be MUCH better, although I’d have to find finer silk thread. I’ll have to investigate this on a future project. Silk thread. Cotton isn’t strong enough for all the pulling. 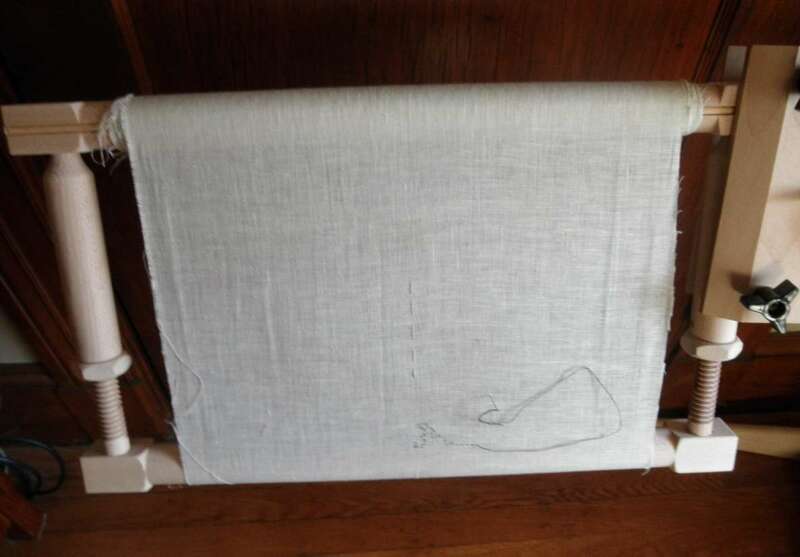 Linen would have the strength, but it would be thicker, filling the holes more (and it was also done in linen historically, for white on white stitching). Slightly blunted slender needle with a small eye. This is only one strand of silk floss, and you need to spread rather than pierce the ground cloth threads. Still, a total tapestry blunt is too rounded for this delicate work. My Gripit frame (scored on Ebay for $30.00) from 4 years ago looks just like yours. I am finding it not that useful for flipping back and forth to finish ends. When I spin the frame to finish off ends, it sounds like a door opening in a haunted house. And it’s clunky. I use it mostly for net darning large pieces, since I no longer do much embroidery. Catherine is your friend like the Millenium frame. If so would you be interested in selling it? I like the concept of the square frame, however I have a jacked up wrist which makes it very hard to hold the heavy frames and I wasn’t pleased with the side to side stretch on the frames I have tried. Have you had these problems before with other square frames? I will admit I use the horrible (grin) metal and plastic circle frames to keep the entire project tight enough and small enough for me to manage well, especially since I get darn close to the fabric when working with it. I think I have to agree with Kathryn on this one, it does look very labor intensive, lol. I have enough problems trying to keep up with the regular holbein stitch on timelines, I would hate to think of what would happen if I were doing that….. Maybe one day, we will see….. BTW, I sent my project off to the competition last night, it felt like sending a kid off to school, lol. Do you know what the Millenium frames are still available for purchase? As far as I know, they are. But they are only available from the maker. The order backlog can be very long because it’s a small shop that can’t crank them out at speed.